Thirteen-year-old Ppeekk (pronounced "Peekie") finds a very small, very flat, very dead fish. When he comes to life in her hand, he has an amazing story to tell. In the brilliant underwater world called High Voltage, manatees talk, starfish sing, and practical-joking clownfish encourage children to launch their lunchboxes off the bridge. Now, a fiendish, fifty-foot, prehistoric shark has laid siege to High Voltage and dethroned King Frederick the Ninth (whom Ppeekk calls "Dead Fred"). Megalodon, the morphed monster, reigns amphibiously under the old drawbridge with his army of vicious crabs and blood-red remora fish, whose suckers drain victims' joy and imagination. Can Ppeekk save High Voltage from the evil Megalodon and return Dead Fred to his rightful throne? Ppeekk and her friends use everything they've got--exploding coconut bombs, strangler fig lassos, even themselves as human bait--to vanquish the terrifying beast and his rogue army. Their adventures culminate in the battle of their lives, fought in a Category-5 hurricane. 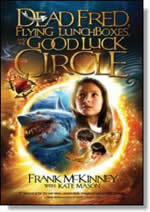 Best-selling author Frank McKinney boldly enters young reader fiction in this fantasy novel that is sure to race and gladden the hearts of readers of all ages. The story was inspired by the more than 1,000 walks to school the author has shared with his daughter and her friends in real life. Come along with them into the imaginative world of Dead Fred, Flying Lunchboxes and the Good Luck Circle! Peekk woke, her nostrils flaring to the faint smell of fish. It wasn't a strong odor, but it was unmistakably fishy. She glanced at the alarm clock on her bedside table: 6:03 am, time for her usual pancakes and bacon—not fish. Still half asleep, she turned her head, cracked open one lid, and stared directly into the eye of a small fish lying right on her pillow. Whoa! How did a little fish get onto her pillow? Maybe she was still asleep. But the fish stared at her, too. Then it all came rushing back to her—finding him on the bridge, hiding him in the usher's coatroom in the church, and finally stashing him in her backpack and hurrying home with him. She'd placed him in between her pillow and the pillowcase, right at the edge so he could have a bit of air, as if that made any sense. Somehow he'd wiggled out. Now propped up on his two long side fins, he looked sort of like someone leaning on his elbows. He smiled from gill to gill. "Rise and shine." Frank McKinney is a true Renaissance man: a five-time bestselling author (in four genres), real estate "artist," actor, ultramarathoner, aspirational speaker, and an usher for the past 20 years at his 7:00 a.m. Mass. A "philanthro-capitalist," he has made an unfathomable humanitarian impact in Haiti through his Caring House Project where he has created 27 self-sufficient villages in 24 Haitian cities in the last 16 years, impacting the lives of 11,000-plus children and their families. Frank, his wife, Nilsa, and their daughter, Laura, make their home in Delray Beach, Florida, where Frank wrote The Other Thief in his oceanfront treehouse office.